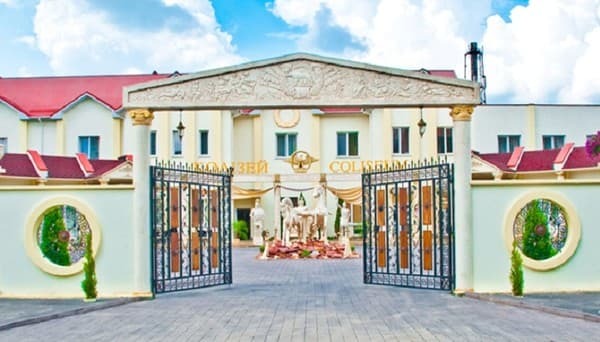 Hotel "Colosseum" is located in the sleeping neighborhood "Near Greciani", 200 m from the river Southern Bug. 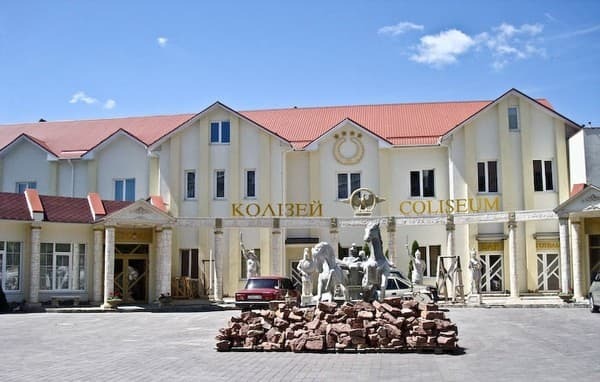 The hotel complex "Colosseum" consists of 14 rooms of various categories. Each room of the hotel is equipped with comfortable furniture, TV, mini-bar, telephone, shower and toilet. Some rooms have air conditioning. Free Wi-Fi is available. 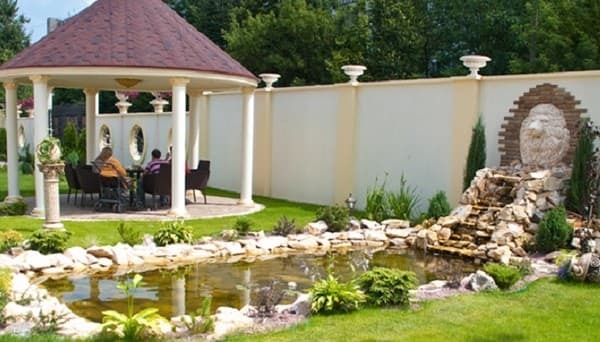 The hotel offers billiards, a restaurant "Coliseum", a sauna and a massage room. Free private parking is possible on site. Khmelnitsky Airport can be reached by car in 40 minutes. The distance to the railway station is 6.4 km, to the central bus station - 9.3 km. Description of the room: Rooms with two separate one and a half beds. Room 202 is made in warm brown and sand colors, creates a feeling of comfort and will help to relax as much as possible after a day's work, the beds in the room do not move. Green - the color of nature, which is the dominant color in the room 203, if necessary, the beds can be moved. In room 204 an unusual interior reminiscent of bamboo canes, shades of brown and sand emphasize a pleasant atmosphere for relaxation, the beds are shifted. 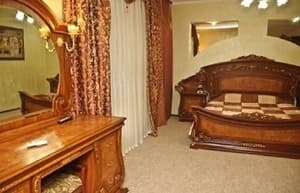 Description of the room: Rooms with a large double bed. Spacious 201 room with a color range from pastel-beige to brown will create a relaxed and easy environment for relaxation. A special atmosphere reigns in 205 rooms with lilac-pink walls, at night the aromalustra will surround you with freshness and ease of wildflowers. Modern 206 rooms embroider their geometric designs, active coloring of the walls. Room 209 - light and quiet, will set you up for maximum rest, for special comfort the room is equipped with air conditioning. Description of the room: A pleasant surprise for the guests of the GRIZ "Kolisei" are four double rooms of the "Lux" class with one large bed, which will truly surprise with its stylistic originality and uniqueness. Description of the room: A particularly gentle and light color scheme of the room creates an atmosphere of lightness and weightlessness. White furniture with golden finish, soft creamy curtains, light leather one-and-a-half sofa in the rest room. Description of the room: Studio, located on the first floor of the complex with separate entrance, designed for family living. The sleeping area with a large bed and a pull-out sofa, dining area with table, LSD-TV, air conditioning. Mini-kitchen area and a large bath. 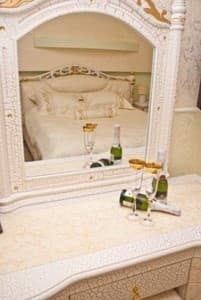 Description of the room: Every detail of the room is thoroughly impregnated with classics - this is the skilful work of Italian furniture makers, this is a beautiful landscape, painted on the wall in the living room, it's branded crystal dishes. In the living room there is a beautiful round table. Чистота, дружественный персонал, все что мы просили дополнительно (посуда, утюг) - предоставили быстро и качественное. Хороший номер, качественный матрас, отдыхалось хорошо. Не было интернета. Горячая вода была теплой. Большой уютный номер.особенно понравилась большая ванна. Все хорошо!!! Персонал идёт на встречу в любой ситуации!!! Очень вкусные вареники в кафе!!!!! Жена, Я и двое детей остались всем довольны!!! Спасибо! сніданки з 8:00, для ділових людей не надто зручно. Бажано з 07:00. Достойная гостиница. Европейский уровень номеров и цен. Вкусная "кухня". Завышена цена проживания (Киевские цены). Отличный персонал, хорошая кухня, неплохой номер. Есть все, что необхадимо. Не глаженые халаты. Лопнутый шланг в душе. Всегда занята сауна не собственными клиентами. Не убрана от снега и льда территория, не возможно ходить. Постель,полотенца,халаты серого цвета оставляют ощущения грязного белья.Отдохнуть на 2 этаже в выходные не удастся,т.к. ресторан обслужывает свадьбы и слышимость составляет 100%. Комфорт,семейная обстанока-при оболуживании. Сменившийся персонал знал какое вино нам понравилось вчера, помнили что мне нужен замеитель сахара-не мелочь и приятно. Плохой подъезд к гостинице (очень тяжело было найти), отсутствие по умолчанию завтрака в цене номера. Accommodation of children up to 5 years old with parents in one room is free of charge; from 5 to 12 years (in one room with parents and provision of a separate bed) payment is 50% of the cost of extra bed; when placing children from 12 years of age, the payment is made in full (payment from 50.00 UAH). 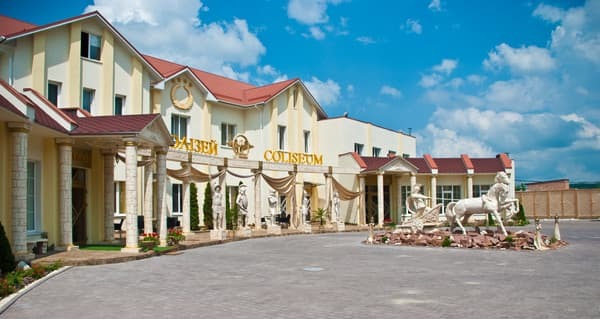 The restaurant of the hotel "Colosseum" serves dishes of Ukrainian and European cuisine. 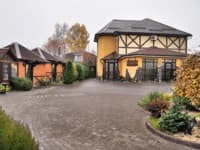 The restaurant is open from 12.00 to 00.00. The cost of breakfast is 75 UAH. 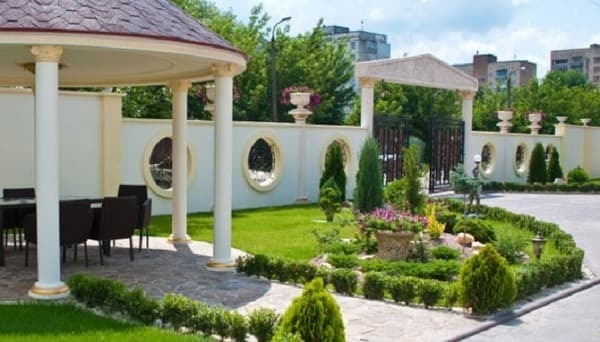 The hotel is located in the residential neighborhood "Near Greciani", 7-10 minutes drive from the city center, but at the same time in 5 minutes walk to the river bank. The Southern Bug and the beautiful park named after. M. Chekmann. The distance to the railway station is 6.4 km, to the central bus station - 9.3 km. From the street. Kamenetskaya turn to st. Kurchatov and there take for the landmark st. Chkalov 1a. In the GPS-navigator it is better to enter the address of ul. Chkalov 18 (residential house opposite the complex), so customers can avoid the dirt road, which navigates when entering the actual address.